Now that the weather is warm there is opportunity to shake off the winter doldrums and get the kids some fresh air and sunlight. Hopefully getting your kids to want to spend time outdoors will not be an issue for you but if it is you may just have to get creative. Indoor entertainment certainly has its place but when they get outside to play or just enjoy a sunny day they get exercise and they connect with nature. Richard’s Louv’s book Nature Deficit Disorder is just full of reasons why we need to make a conscious effort to get our kids out of doors. One simple way to do this is to take story time or homework outdoors. This being Earth month it is the prefect time to grab some eco conscious books aimed at kids and grab a spot under a nice big tree and read to your children. In fact, for all sales of the book Barefoot Book of Earth Tales, Barefoot books will plant a tree in association with EcoLibris. Then your kids can learn about different cultures, their connections to the environment around them, and enjoy time in nature themselves. All you need is a good book and a nice cozy spot outside. You might also want to try a reading pillow like the one pictured above. 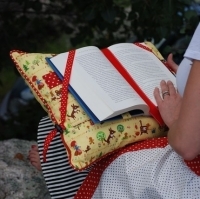 The etsy seller montessoribyhand has a wonderful pattern to make this reading pillow. Kids could do their nightly reading for school or their homework outside too. By providing opportunities for them to explore and learn in nature when they are young we are hopefully creating the future protectors of our environment. Earth Tales is a great book. My daughter really enjoyed doing some of the activities inside the book too. We are now collecting corn husks to make the corn husk doll as featured in the American South West story. Anyone in Chandler Arizona, there will be an Earth day festival at the Chandler Farmers market on April 23rd, I will have limited numbers of this book to buy. Remember to bring all your old ink cartridges etc for recycling.